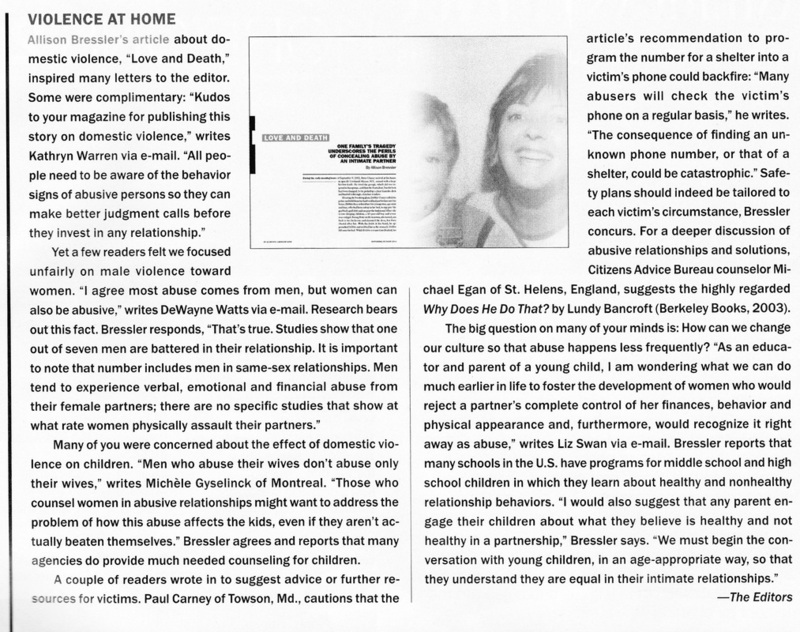 In the November issue of SA Mind Allison Bressler wrote an article on Domestic Abuse. Her article was bias toward abused carried out by women. She focused only on abuse done by men to women. Since I have suffered abuse at the hands of women I wrote the magazine and they published a portion of my email. Others felt she was off the mark as well, and she also gave advice that could get a victim of abuse killed, which is also covered in the clip below. In short Allison made several errors in her advice which could prove dangerous but also is the underlining reason why men do not reach out for help. Articles such as hers suppress men to continue to keep quiet, and articles such as hers are a danger for men being abused. On Tuesday November 25th 2014 BlogTalkRadio conducted a round table interactive discussion on the topic of Male Child abuse to bring attention to the first week in December which is National Male Child Abuse Awareness. 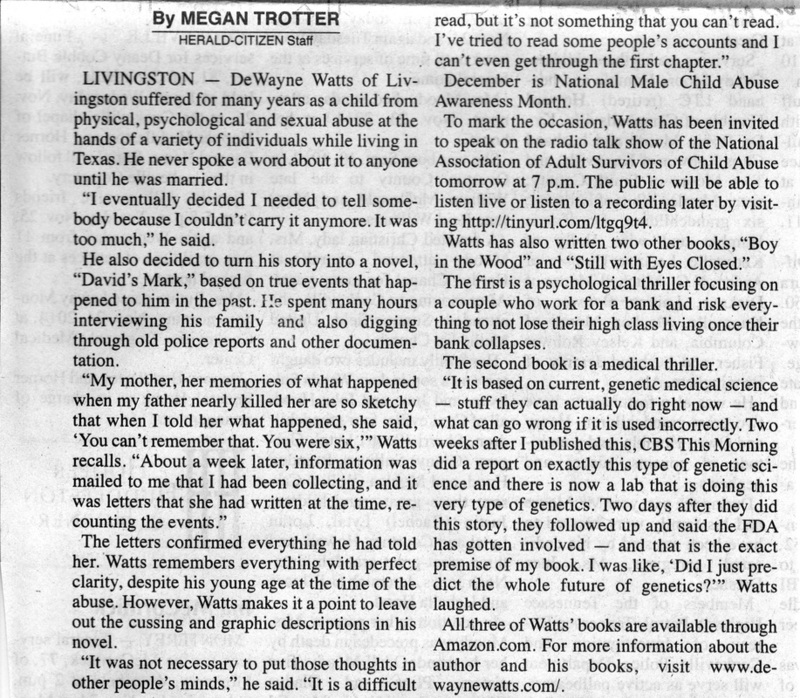 The topic included my book "David's mark" which talks in a lot of the abuse I suffered. You can download that show an listen to it, or goto http://www.blogtalkradio.com/bill-murray and listen to it. For more information about Male Abuse Awareness Please see the following websites. 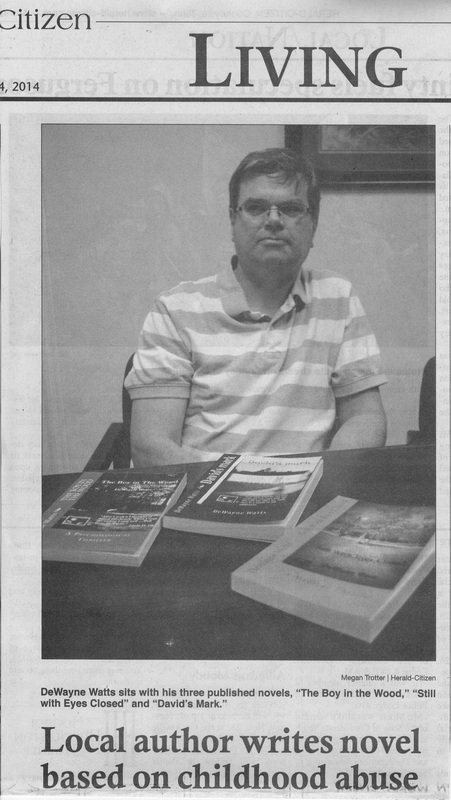 The Herald Citizen newspaper ran conducted an interview, featured was an upcoming interview with BlogTalkRadio. The focus of the topic was my book "David's mark"